The Bf-109E was the first Daimler-Benz powered 109, first entering squadron service in late 1938 and seeing its first action in the Spanish Civil war, which ended in early 1939. By the time that war had broken out in September of 1939, over half of the fighter force was made of Bf-109s. The E-3 was an improvement over the earlier E-0 and E-1 aircraft, mainly in that it had the engine mounted MGFF/M 20mm cannon. The aircraft had originally been designed for this cannon, but it wasn't until the E-3 that it saw widespread use. Along with earlier E-1s, the E-3 was used a great deal during the opening phases of the war and well into 1940. The majority of Bf-109s used during the Battle of Britain were the 109E-3 and E-4 model. Most of the E-3 aircraft were delivered with the later camouflage scheme of RLM 71/02 uppers with RLM 65 lower surfaces. The interiors of these planes were all painted in RLM 02 as the requirement to switch to the darker RLM 66 wasn't made until late 1940. After the E-3 variant, the E-4, which deleted the engine mounted cannon, was produced. This is distinguishable from the E-3 by having a more square windscreen and canopy. This canopy and windscreen was retrofitted to a number of E-3 variants. The E-3 was not plumbed for a drop tank, that being done on the E-7 variant. Editor's note: I have been informed by reader Emil Pozar that there are some errors in the history section. Here is what Emil said " E-3 introduced two wing_mounted_cannon (instead of machine-guns) and *not* that ill-fated engine-mounted FF! (E-2 was with cannon..). That cannon was NEVER in widespread use in any "E". He also corrected a couple of other minor errors for me. Modeling Madness appreciates these inputs in an endeavor to be as correct as possible. Often references that are used, especially if they are older ones will contain errors and inaccuracies. I must, however, point out that my reference states on page 472 " ..the E-3, which reached the Luftwaffe during the early summer of 1940, (had) four MG 17s and an engine mounted MG FF/M cannon". The author then goes on to say that this cannon was removed from the E-4. As you can see, there is an inconsistency. The first thing that came to my mind when opening the box is, "Where is the rest of the kit?". The single main sprue looks very lonely sitting there in the bottom of the box. It looks like you could stack two or three more sprues in there with lots of room left over! In other words, it is a rather small kit in a rather large box. 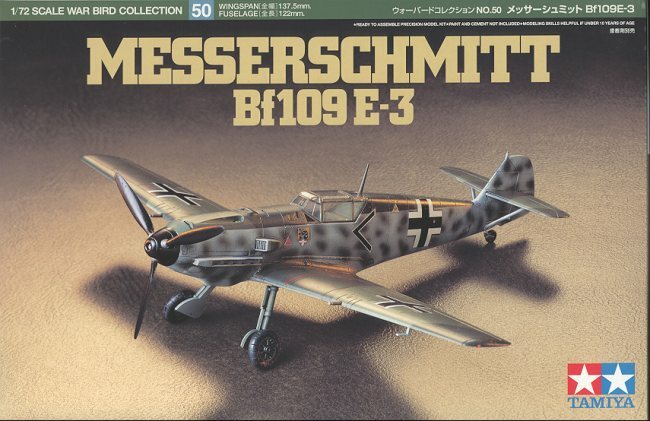 It will come as no surprise to you that the 1/72 Bf-109E-3 looks a lot like the 1/48 Bf-109E-3. The main differences are the simplification and combination of parts. In other words, there isn't as much detail. Gone are the separate flaps and slats, but this is in common with their other 1/72 shrink down kits. 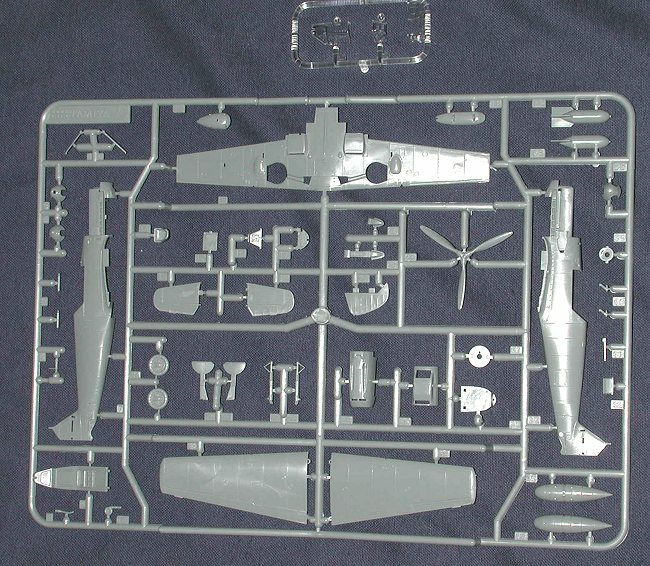 It is obvious that this sprue is also meant for the upcoming BF-109E-4/7 kit as all the bits and pieces are there. The drop tank, bomb, bomb racks, different spinner and the tropical intake are on the sprue. However, you cannot model the E-4/7 with this kit as you get the clear bits (I.e. canopy) for an E-3 and those bits are different. Sorry about that. Detail is all that you should expect from Tamiya. Interestingly, it doesn't seem as heavy handed in this scale as it did in the 1/48 kit. Rather than lots of detail bits to stick in the interior, that stuff is molded on the side, though it is quite shallow. I would think that True Details would make a lot of money doing a 109E resin interior for this kit. One other thing is that the error on the shape of the nose doesn't seem to have translated from the larger scale 109E-3 to this kit. Apparently Tamiya chose to use the E-4/7 molding to pantograph down. Instructions are the usual superb ones that come from Tamiya. In the 8 pages, 2 1/2 are devoted to 7 construction steps, and 3 of them are devoted to decal/camouflage markings. There are three aircraft options on the decal sheet, all from 1940. First is Galland's aircraft from JG 26. Second is a 4./JG 77 aircraft, white five. Finally is a mottled one from II./JG54. 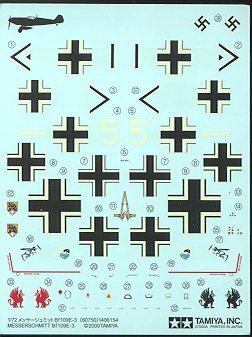 The decal sheet includes all markings as well as swastikas. All of the aircraft are in the standard 71/02 uppers with 65 lower surfaces. The painting instructions for the interior would have you paint much of it in a very dark grey, like RLM 66. This is totally inaccurate for the period as the interior should be in RLM 02 green grey. If this is like other Tamiya kits, even a beginner should be able to produce a quality kit in a short period of time. The big question is whether it is worth the premium price. That is up to the buyer to determine. German Aircraft of the Second World War, by JR Smith & Anthony Kay, Putnam, 1972.